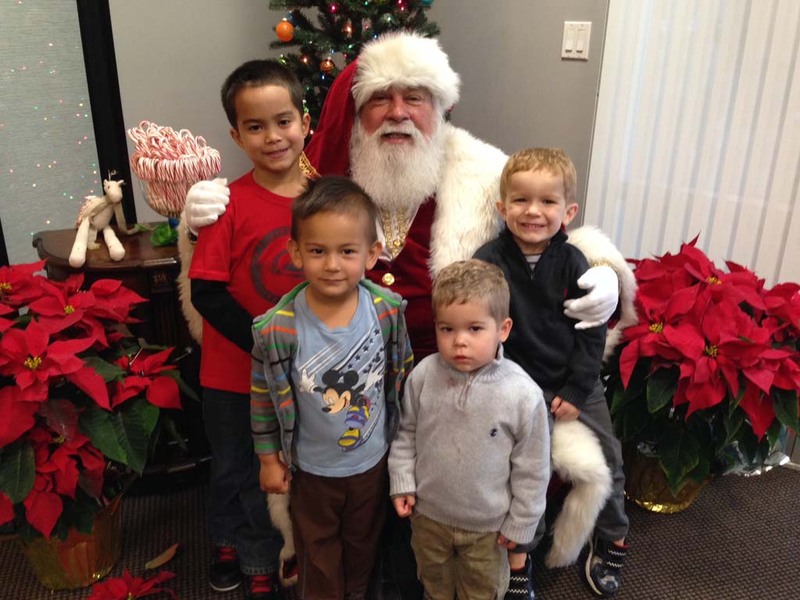 CARLSBAD — Children scampered into the Carlsbad headquarters of Extraordinary Conceptions, an international surrogate and egg donor agency, to sit on Santa’s lap and rattle off their Christmas gift wish list. Some lists were long and others quite short. While the children kept Santa busy, the afternoon also painted a day brimful of giving back to the local Vista nonprofit, Solutions for Change. Solutions for Change help homeless families by placing them in a shelter and then ultimately transferring them to transitional housing. It’s dedicated to find a myriad of solutions to combat homelessness through education and awareness. The Dec. 16 debut event marked a day of hope for the holidays. The collection box for Solutions for Change overflowed with blankets, children’s pajamas, clothing, and toys for boys and girls of all ages. “I am just overjoyed,” said Stephanie Barry, a volunteer at Solutions for Change. Barry shared that as a child, sometimes the Christmas season couldn’t afford her the gift she wanted. But looking at the pile of toys in front of her at the Extraordinary Conceptions’ lobby was emotionally overwhelming. “This is such a special gift and Extraordinary Conceptions has been so generous,” she said, adding how the company also made a kind donation. The gifts will be wrapped and distributed at the nonprofits’ upcoming holiday party. Barry shared she had a special link with the Carlsbad-based business. She applied to be a surrogate in 2012. Director of marketing at Extraordinary Conceptions, Erica Hawkesworth, said their company is so fortunate to have grown over the years. It moved from its very small space in San Elijo Hills about three years ago. According to Hawkesworth, they wanted to have an open-house style event to introduce themselves to local Carlsbad businesses and residents, as well as inviting its neighbors in San Marcos to come see how they have grown. The holiday gathering lasted two hours and nearly 100 people came by to visit Santa and donate to Solutions for Change.